Powered by Rival Casino software, DaVinci's Gold Casino offers players a gaming experience that can only be rivaled (pardon the pun) by a weekend in Monte Carlo. This casino's selection of slot machines (particularly video slots) is second to none, as Rival Casino software is known for producing some of the most exciting slot games online. In addition to classic and video slots, Rival delivers a slot machine experience that is sure to blow your mind: i-Slots (more on these later). DaVinci's Gold features crisp graphics and sound, as well as an easy to navigate lobby. DaVinci's Gold offers new depositing players a generous 200% match bonus, up to $200 in free casino money. If you're looking to get online and playing at DaVinci's Gold right now, but are hesitant to deposit any funds, then perk up and take note: for a limited time, DaVinci's Gold is giving all new sign ups $22 free to play with! That's right - you'll get $22 in free casino money simply for signing up. Without even requiring a deposit, DaVinci's Gold gets you in on the action in no time. DaVinci's Gold Casino boasts a collection of over 100 games, including table games, slot games and video poker games, as well a host of specialty games. Card game players will flock to popular offerings such as Pai Gow Poker, Blackjack (several variations to choose from), Baccarat, Caribbean Stud Poker, Red Dog, Let It Ride, and more. DaVinci's Gold offers popular video poker games such as Jacks or Better, Aces and Faces, Joker Poker, Deuces Wild, Double Joker and several others. Slots players will want to check out DaVinci's Gold's awesome array of video slot machines, including Flea Market, Travel Bug, Circus Slots, Gold Rush, Chicken Little, and more. If you're looking for Rival Powered i-Slots, then DaVinci's Gold will certainly be the place to visit. i-Slots such as Baby Boomers, As The Reels Turn, Cosmic Quest, Hole in Won, and several others will bring your level of interaction to heights never before achieved in a slot game. i-Slots players watch animated videos, play games within the game, and stumble upon many bonus features. DaVinci's Gold Casino accepts players from everywhere, including those of you from the US. 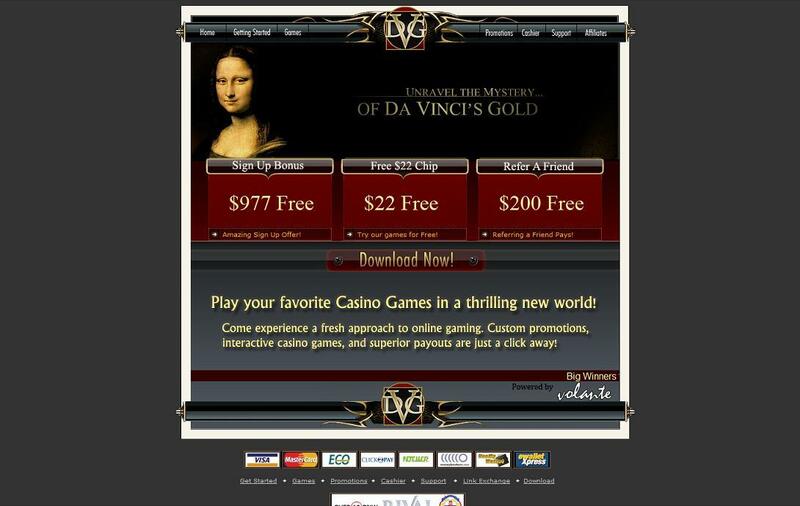 Download DaVinci's Gold Casino software right now to experience the online gaming thrill of a lifetime!